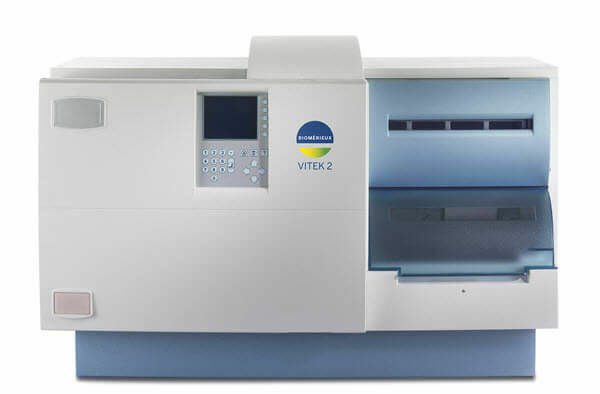 The innovative VITEK 2 microbial identification system includes an expanded identification database, the most automated platform available, rapid results, improved confidence, with minimal training time. The VITEK 2 system next-generation platform provides greater automation while increasing safety and eliminating repetitive manual operations. The rapid response time means results can be provided more quickly than with manual microbial identification techniques. The system includes an ADVANCED EXPERT SYSTEM (AES) that analyzes MIC patterns and detects phenotypes for most organisms tested. This helps optimize laboratory efficiency for lean laboratory management. Rapid results allow clinicians to discontinue empiric therapy and prescribe targeted therapy, resulting in improved patient outcomes and enhanced antibiotic stewardship. With its ability to provide accurate “fingerprint” recognition of bacterial resistance mechanisms and phenotypes, the ADVANCED EXPERT SYSTEM (AES) is a critical component of VITEK 2 technology. 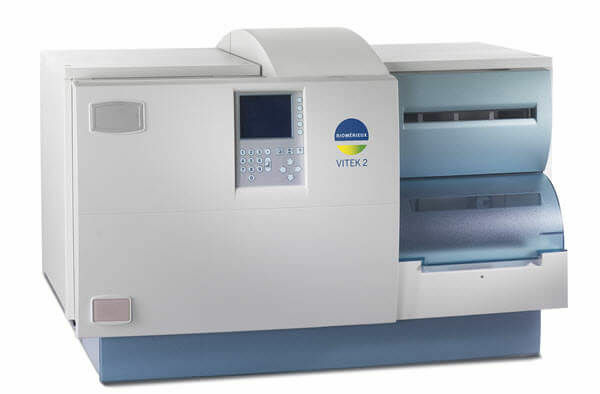 VITEK 2 is a fully automated system that performs bacterial identification and antibiotic susceptibility testing. 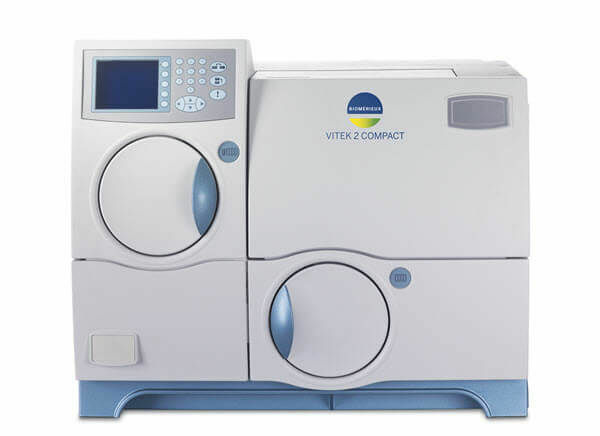 The VITEK 2 Compact bacterial identification system, which is available in three sizes, brings VITEK 2 technology to laboratories of every size. This instrument uses the same ID/AST cards, data management software and ADVANCED EXPERT SYSTEM™ (AES) as the larger VITEK 2 instrument. The wide variety of VITEK 2 identification cards (ID) and antibiotic susceptibility testing (AST) cards provides testing flexibility. This unique feature helps the laboratory control expenses and eliminates unnecessary testing. The VITEK 2 System and Test Cards originated with the NASA space program to identify infections in astronauts. This breakthrough innovation led to today’s VITEK 2 technology. The VITEK 2 card is the size and shape of a playing card and contains 64 microwells. Each well contains identification substrates or antimicrobials. VITEK 2 offers a comprehensive menu for the identification and antibiotic susceptibility testing of organisms. The VITEK 2 Test Card is sealed, which minimizes aerosols, splattering, spills, and personal contamination. 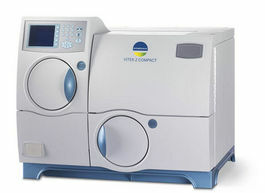 Disposable waste is reduced by more than 80% over microtiter methods. Intuitive, icon-driven software in a familiar Windows® format. ADVANCED EXPERT SYSTEM (AES) analyzes MIC patterns and detects phenotypes for most organisms tested. This helps optimize laboratory efficiency for LEAN laboratory management. OBSERVA is an information management system that stores the test data generated by the VITEK 2 or VITEK 2 Compact. The information is then gathered and formatted into many vital reports, including epidemiology and statistical reports. Additionally, data can be exported for analysis in other PC-based software programs. 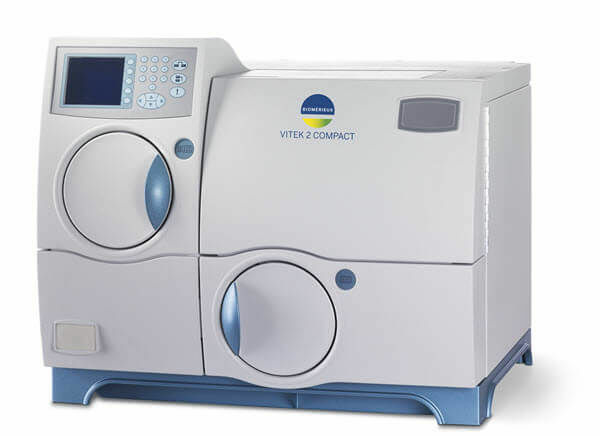 Not available for VITEK 2 Compact 15. Click here to view a demo of OBSERVA. PC5.01 introduces new features to enhance efficiency and workflow. Multi user remote access, preliminary results, and new menu options have been shown to improve laboratory operations. This module provides your laboratory with the ability to store the VITEK® 2 Card Quality Control results and track quality control performance. Cumulative Quality Control reports are easily generated and can list all results with the exceptions flagged or list exceptions only. 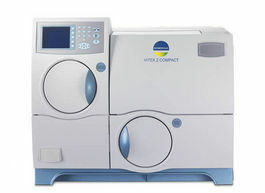 With the Bi-directional Computer Interface (BCI) package, the VITEK 2 can receive patient information directly from the Laboratory Information System and transmit microbiology test data directly to it. This minimizes keystrokes and data transcription errors while automatically uploading test data into the LIS. BCI plays an integrated role in providing rapid reporting of identification and antimicrobial susceptibility results. The Evolution of a Superbug. Initially discovered in the late 1950s, only 10 years after the birth of the first antibiotics, antibiotic-resistant bacteria, or "Superbugs," have become one of healthcare's biggest dilemmas. Once wrangled under control by the exciting new power of drugs like penicillin and tetracycline, Superbugs have learned to adapt and mutate to antibiotics, passing on their resistance to new generations, across species. With more than 110 million antibiotic prescriptions being written a year, doctors must find new ways to take on Superbugs, such as curbing antibiotic overuse and developing new technologies and drug-delivery systems. bioMérieux provides in vitro diagnostics solutions for doctors so they can effectively treat patients. bioMérieux helps doctors determine whether or not to treat a patient with antibiotics and deliver susceptibility results on what may be the most effective antibiotic to use.